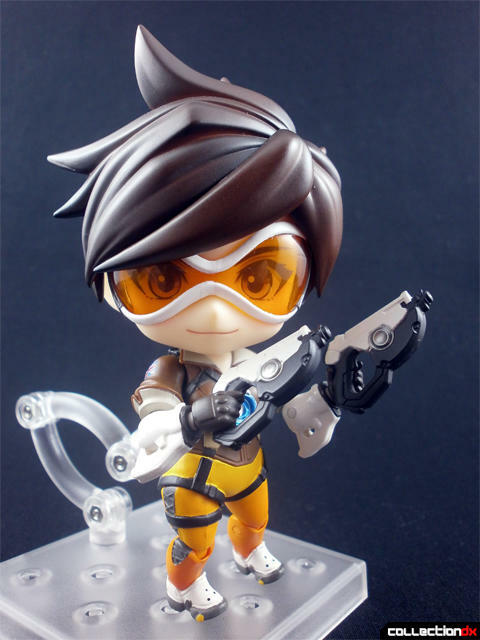 If you’ve managed to avoid hearing the word “Overwatch” to this point, I’m not sure how you pulled that off, but it’s Blizzard Entertainment’s massively popular first-person shooter with a wide variety of characters to play as. 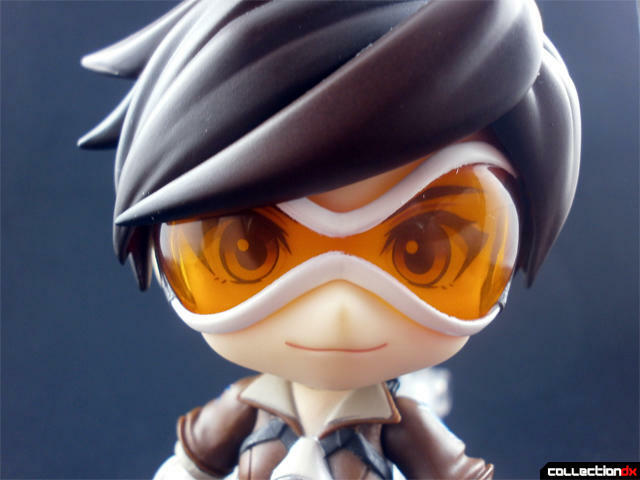 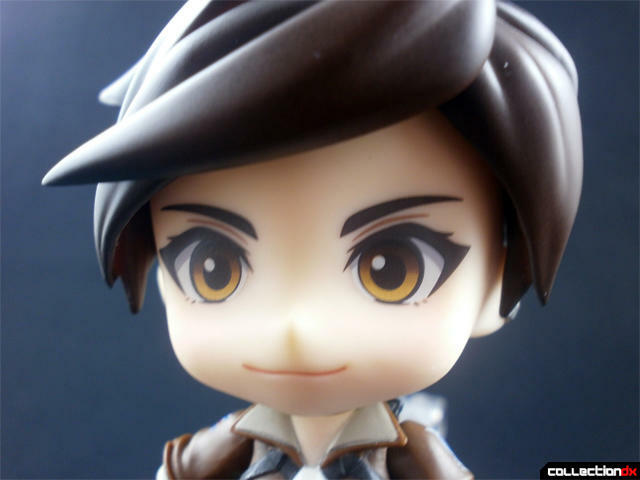 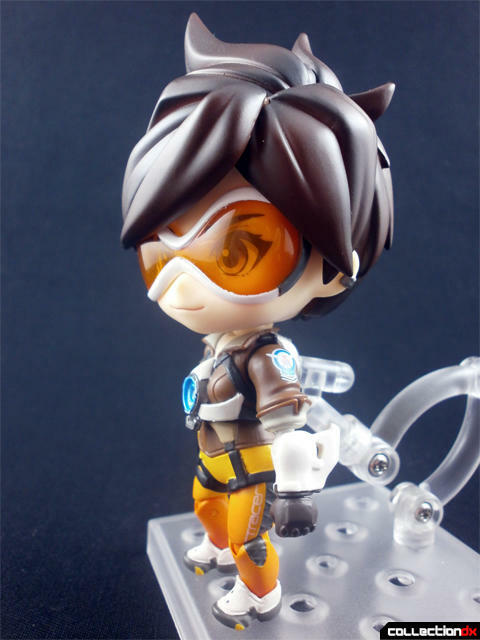 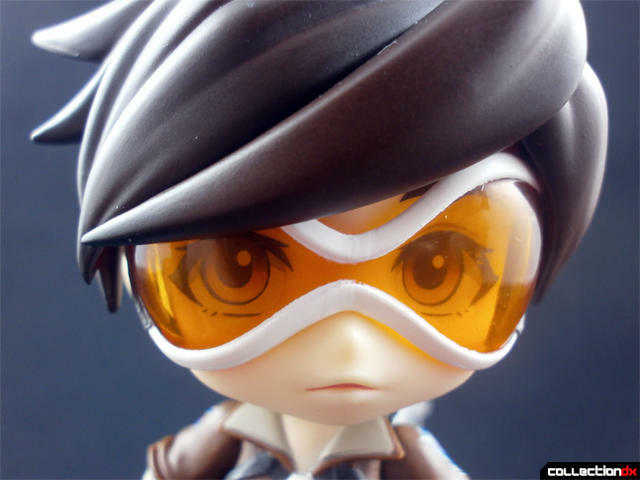 Even Japanese toymaker Good Smile Company is getting in on the merchandising, starting with a super-deformed Nendoroid figure of Tracer. 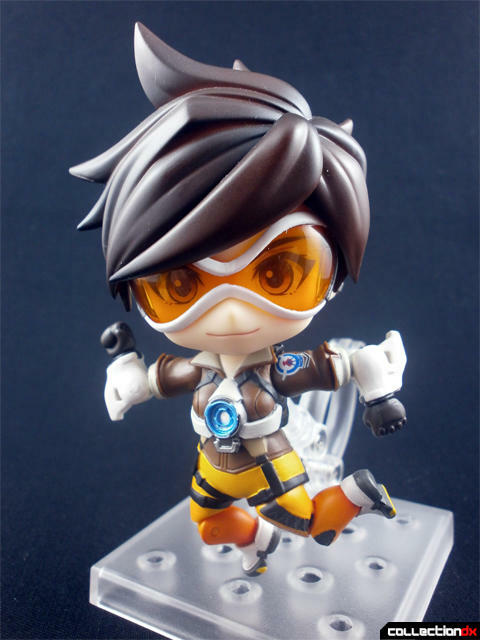 I’m truly impressed by how fun and well-made she is. 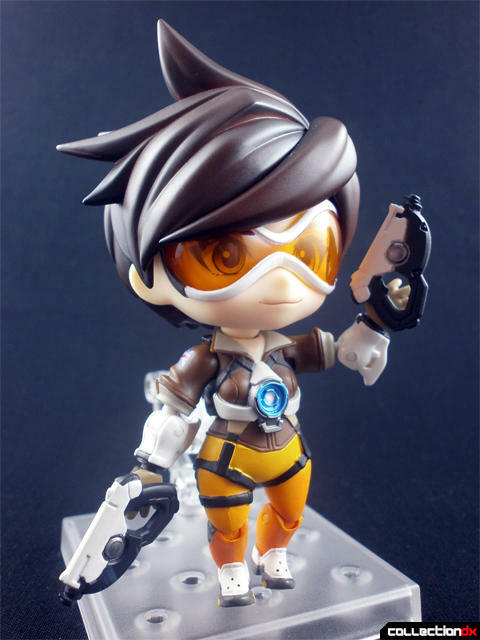 Tracer comes with two swappable faces, two sets of alternate hands, her pistols, Pulse Bomb, an interchangeable right leg, and a space joint piece. 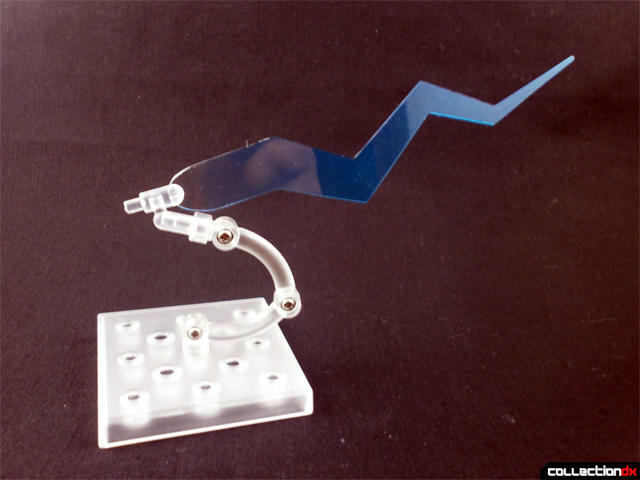 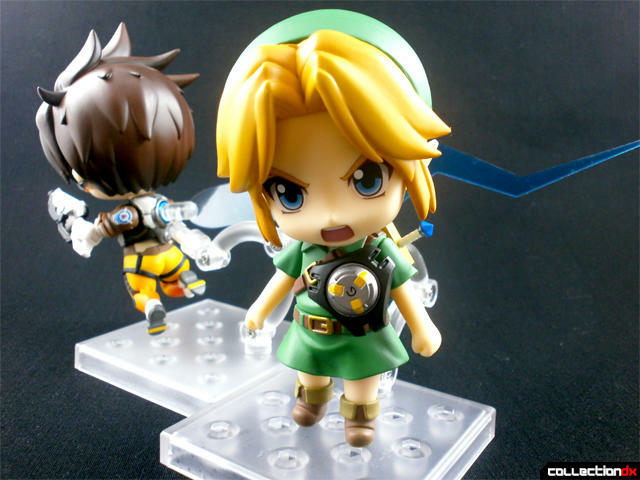 The usual Nendoroid stand has been enhanced to hold a blue dashing effect part. 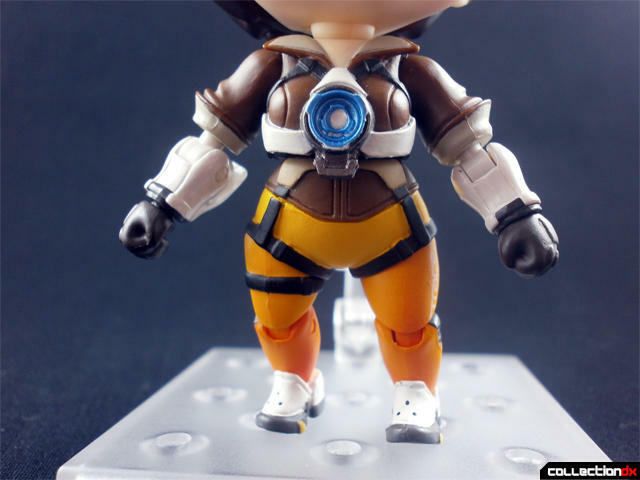 For only being about four inches tall, Tracer is extraordinarily well detailed. 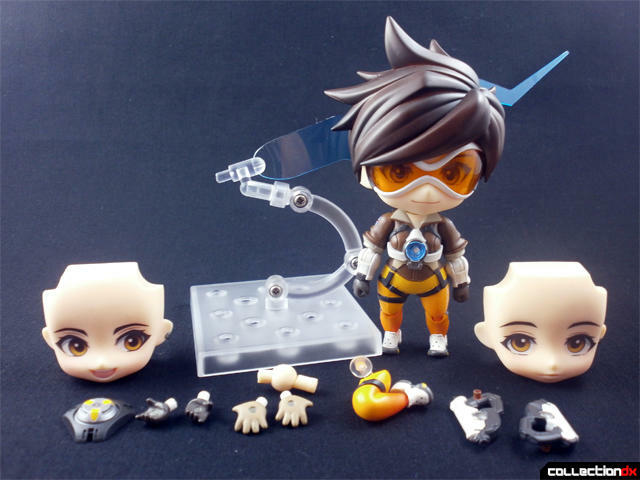 She’s also remarkably articulated for a Nendoroid. 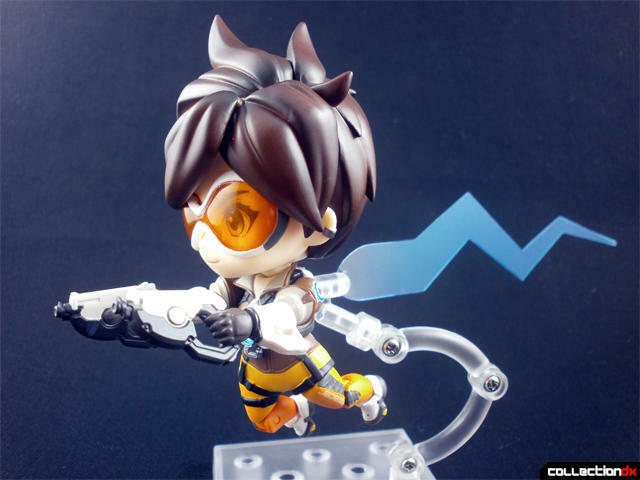 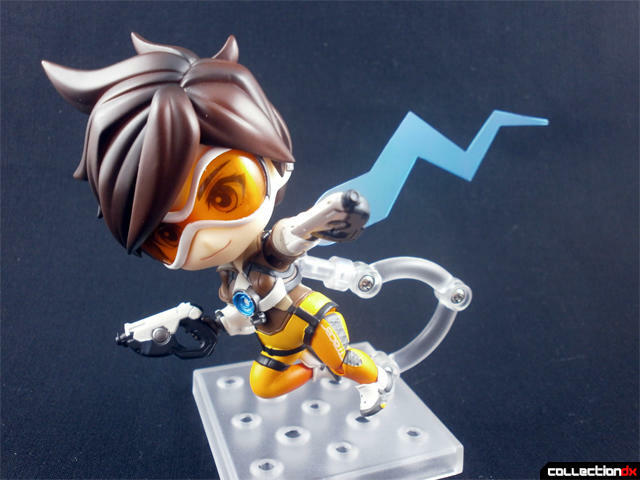 While usually Nendoroids focus more on swapping arms out to replicate poses, Tracer can bend her arms and legs ninety degrees no problem. 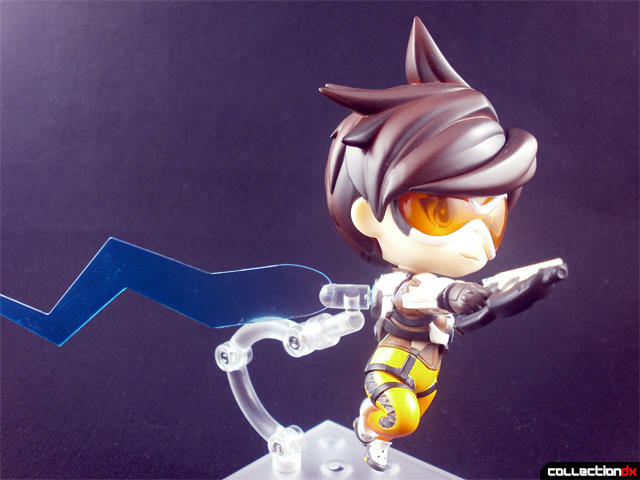 Tracer’s third face is specifically to recreate her pose on the Hero Select screen where she blows her hair back in place, so her hair is jointed too. 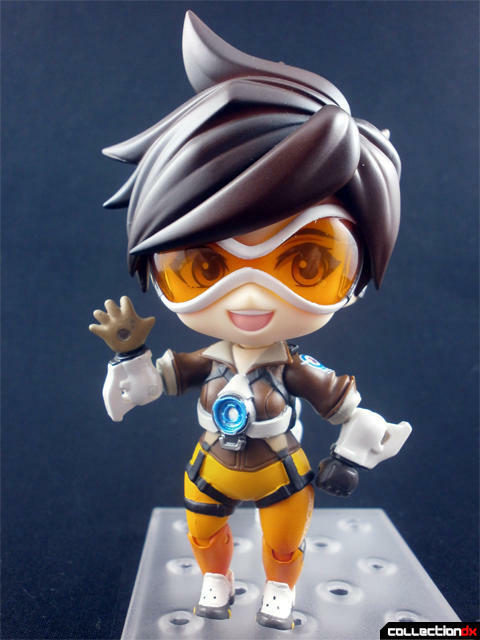 To swap a face in, simply remove the front hair piece and make the switch. 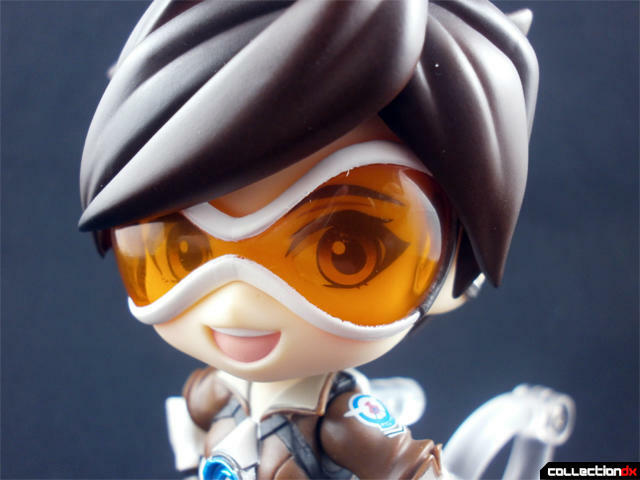 You can also remove the goggles if you like. 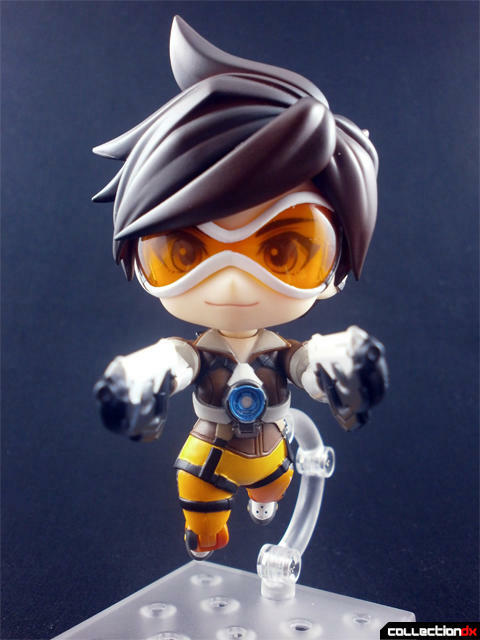 Tracer comes with two sets of hands that can hold her guns. 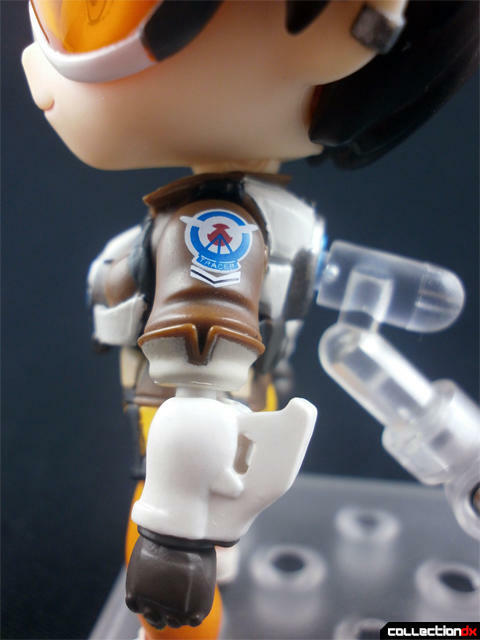 One holds the guns normally, the other is an open palm that a peg on the gun plugs into. 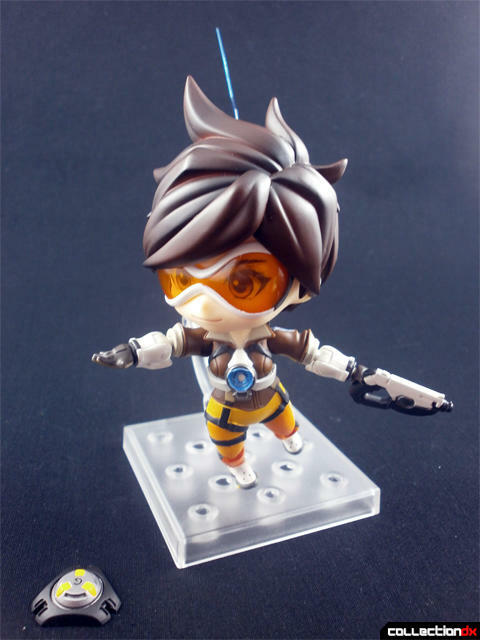 I particularly like the open-palmed ones, which allow you to spin the guns all around like she’s reloading. 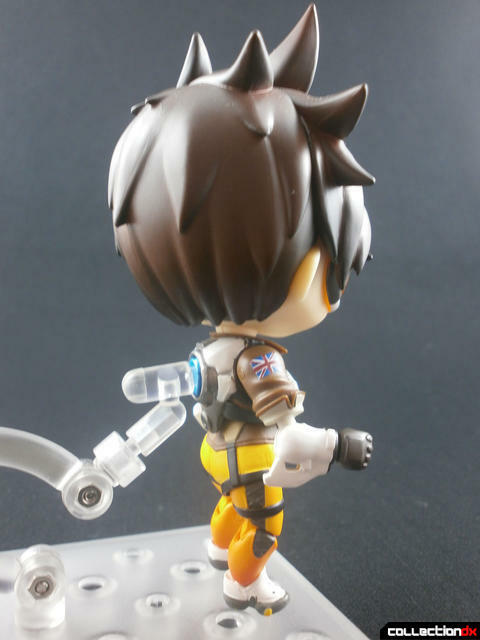 The dash effect part is simple but works wonders for action poses. 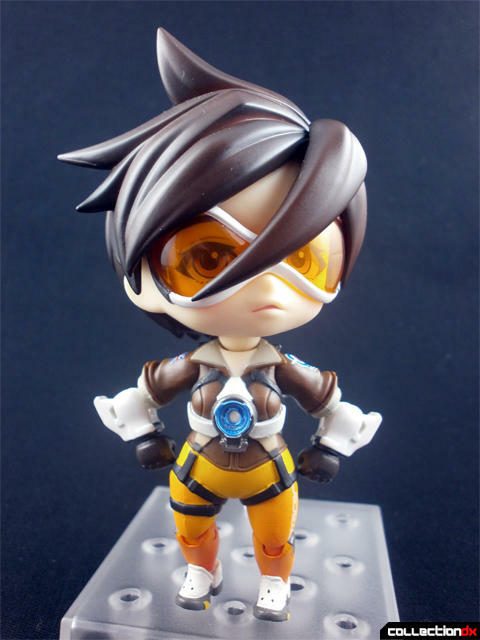 You can swap out Tracer’s right leg for one that looks more natural mid-Blink. 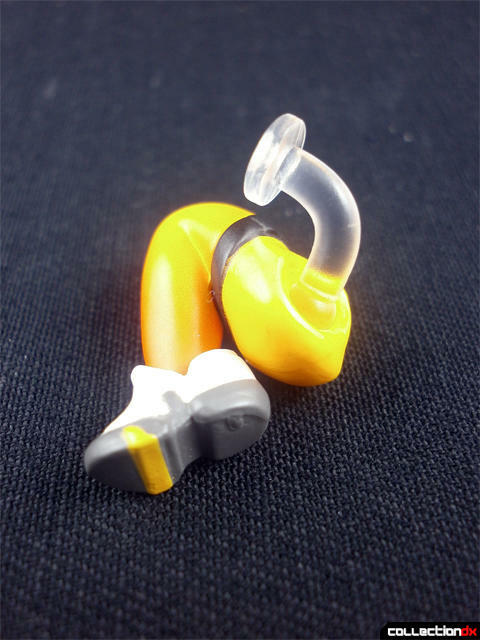 Don’t lose the small clear piece that comes inside it, it’s meant to prevent the joint hole from deforming over time. 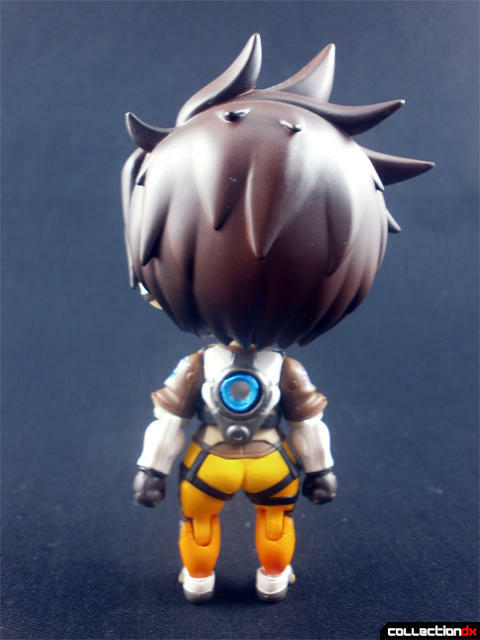 Lastly, the Pulse Bomb, Tracer’s ultimate ability. 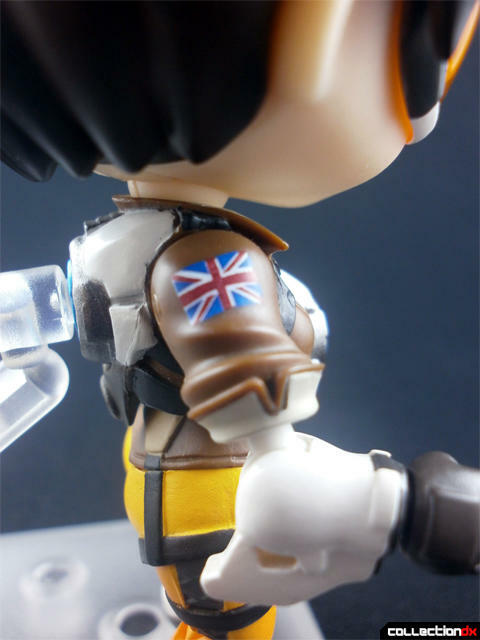 It’s a single simple piece that doesn’t attach to anything, but I discovered it’s easy to put on other figures with a bit of tape. 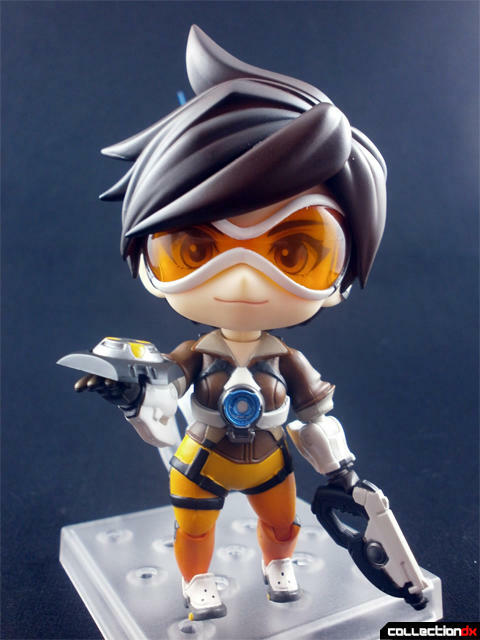 Overall, I’ve had a lot of fun with this figure, and I would happily recommend it to any fan of Overwatch. 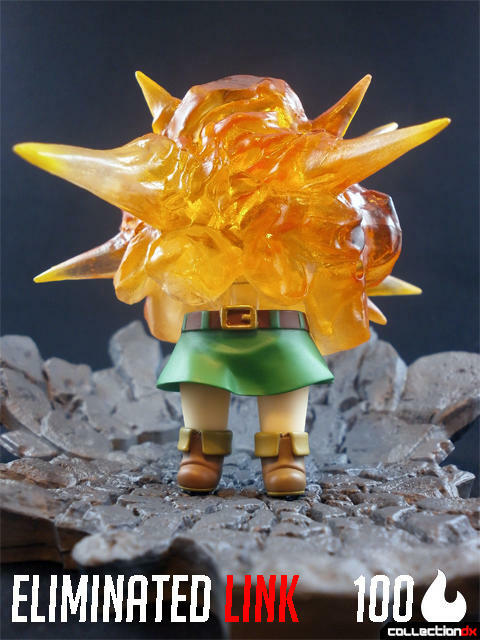 While this is a Japanese figure, you won’t even need to import it, as I’ve seen it pop up at Gamestops and Targets all over. 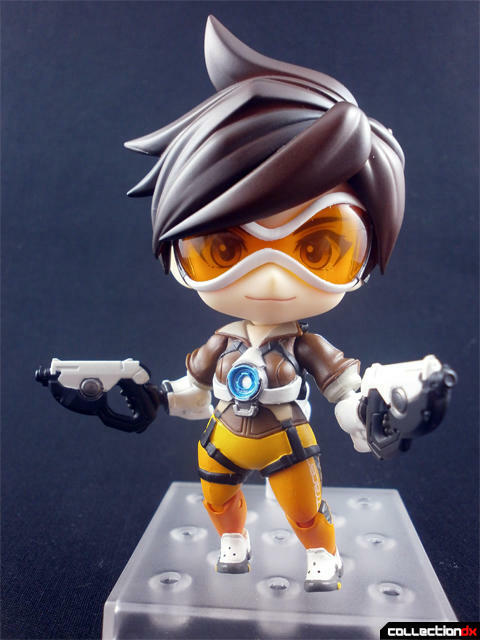 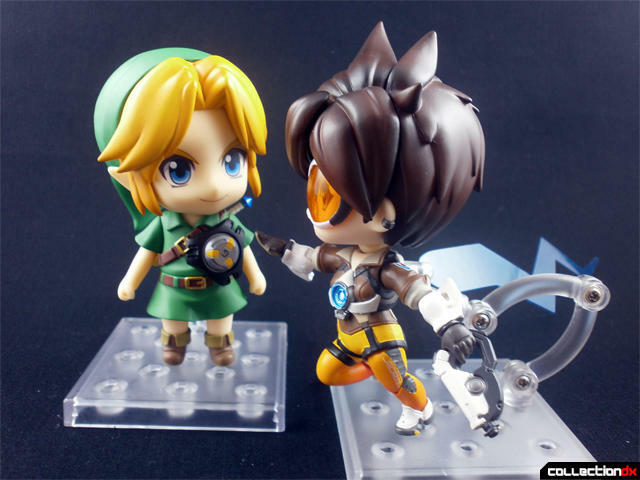 Look forward to future reviews of the rest of the Overwatch Nendoroid lineup.